So this is another inspired recipe, well in truth it a dam rip-off……a rip of from one of the greatest Mexicans restaurants in Dublin: 777. If you find yourself on Georges St in Dublin ya gotta get in there and dive head first into one of the Margaritas, Oyster Shots and the amazing array of crackin’ Mexican food! 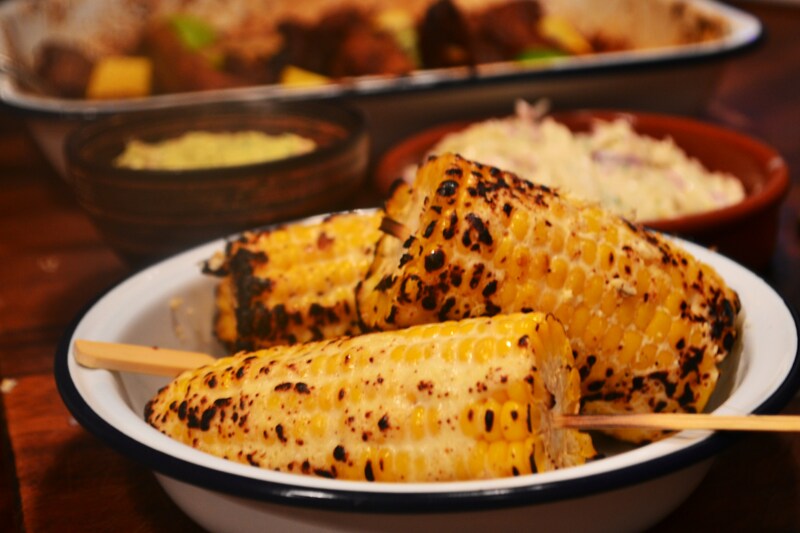 So these are Elotes….corn on a stick slathered in the good stuff – have a pop at these bad boys! And a big thanks to the fab waitress who shared this recipe with me last Friday night…you rock! You can’t really get much easier than this – but they are sides so make sure you have ’em cosied up with good spicy ribs and bonkers slaw! Kick off by cooking the corn in salted boiling water – about 8-10 minutes should do it but stick a fork in ’em to make sure they are done. When the corn is cooled cut each in 2 giving you 4 corn cobs then take some wooden skewers (soaked in water to prevent burning) and skewer them making a ‘handle’ (easier to eat). Next combine the sour cream, lime, cheese and seasonings – you want a fairly thick consistency so it will stick easily to the corn. Paint the corn cob generously with the cream mix and leave in the fridge until you are ready to grill. 1. BBQ: straight onto the grill and char up. 3. My way – straight into the flames of your hob! 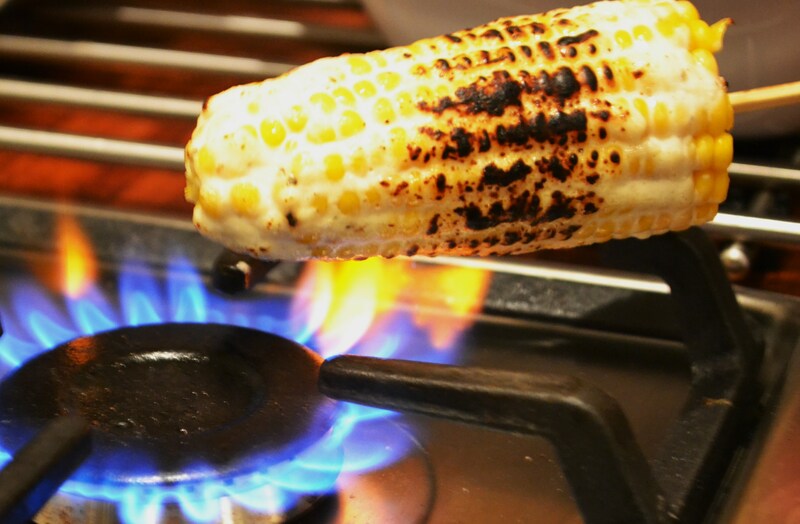 You want to get a good char on the corn and get the cream mix nicely melted and mixed. Looks great! Have you ever tried grilling pineapple? Yum! No – but I will now – you got any suggestions. I saw a recipe once with called for icing sugar??? so sorry I never got back to you. My parents came for their yearly visit from Italy and for 2 1/2 weeks and I’ve been completely distracted. Anyway, I’ve never tried icing sugar but I have tried it with hot sauce, which is really good. Here’s the recipe if you’re interested. I hope your parents enjoyed there stay!! Great! Hope you like it! And yes, we had a wonderful visit although I swear I slept for 2 days straight after they left! As much as I love my parents, it’s just not natural to spend 24×7 with your parents for any length of time! Ha! Tell me about it I know exactly how that feels! I can manage about 2 days every 2 months or so and that is it!! I hosted Christmas last year and they drove my nuts!! I love corn any time, any day, roasted, pickled, boiled and what about the one slathered in good stuff? totally. Thanks I’ve got lots of corn in the fridge right now….will give it a go! Yeah – it knocked my socks off – never had Elotes before!